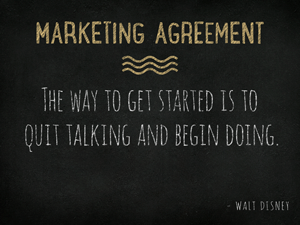 A marketing agreement is a contract between an advertising/marketing agency and a company seeking marketing services. This type of agreement sets forth the parties’ rights and duties. For example, the agreement will describe how the agency will enter into third party agreements to actually produce the marketing materials to the company seeking its services. A marketing agreement should always be written in order to avoid miscommunication or confusion, and should be customized to fit the agreement both parties agree to. Usually, marketing agreements are used by Illinois business entities hiring marketing professionals to promote their products and/or services, and by marketing professionals being contracted to promote products and or services. If you are the business owner or the product maker or service producer or product maker, the agreement needs to represent your brand, in a way that is consistent with the business’s vision. A marketing agreement should always be written in order to avoid miscommunication or confusion, and should be customized to fit the agreement both parties agree to. With this agreement, the product maker or service producer will usually describe terms of payment, billable tasks and include a non-compete agreement. On the other hand, the marketing professional would insist on specific description of how, when, and for what he or she will be paid, and will insist on provisions protecting him or her in the case of a disagreement. Our Chicago corporate lawyers offer litigation and transactional legal counsel to businesses, professionals, entrepreneurs and families in Chicago and throughout Illinois. We invite you to contact our law firm and schedule an appointment for a free consultation to discuss your business matter. Our business attorneys will meet with you over a conference call or in-person at our law offices located in downtown Chicago at 120 N. LaSalle Street .